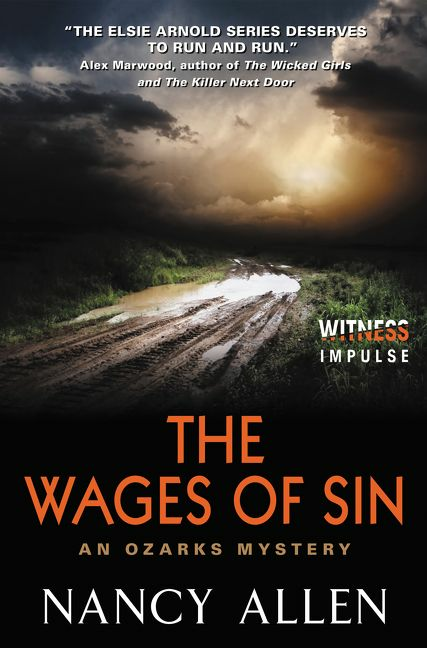 THE WAGES OF SIN by Nancy Allen is the third book of the series that takes place in Southwest Missouri. It is not necessary to read the previous books to understand the plot and characters. Readers will get a very good understanding of how personalities affect court proceedings. The main issues explored are the death penalty, domestic violence, and child witnesses. The novel opens with a pregnant woman being beaten to death by her boyfriend who is high on drugs. Because the eight-month-old baby also died the prosecution seeks the death penalty. Readers will learn certain tidbits, such as the fact that Missouri’s State Constitution considers life beginning at conception. Thus, the prosecution decided to seek justice for the eight-month-old baby rather than his drugged up mother. Because of the horrific crime the death penalty is sought, making it evident that the testimony of the lone eyewitness, six-year-old Ivy, will be crucial. Elsie Arnold, a prosecuting attorney in rural Barton City, McCown County, Missouri, wants to win the case to avenge the death of the mother and her unborn child. But as the trial nears, Elsie begins to harbor doubts about the death penalty itself. Allen explores how prosecutors must weigh the horrific crime versus the heavy burden of seeking someone’s death. In addition, the author emphasizes how friendships can become detached over issues. Elsie is “unfriended” by her fellow prosecutor Breeon over her view on the death penalty. Instead of realizing people cannot agree on everything she becomes cold and distant, refusing to be there when needed by Elsie. Allen also gave a heads up about her future book projects. The next Elsie Arnold book has a standup member of a small town community charged with a crime. Elsie must bring down a person who is at the top of the pinnacle in her community. Allen is also co-authoring a legal thriller with James Patterson, entitled. Juror # 3. It is a new series stated by Patterson that will be part of the Bookshots line. I’ve read all three of the Elsie Arnold legal novels. I totally agree with everything you say in your review, and since I was right there with Nancy in the 80’s, only on the police side of the issues, it all has a ring of truth. I don’t think Mr. Patterson will regret his decision to co-author with Nancy, as she brings a very real feel to her writing, and a fresh outlook.